Easy to pick up, quick to start, fun. The level of detail on the cards is outstanding. Physical card quality could be better and actual bricks-and-mortar shop price is high due to demand. Fantastic game, worth buying, especially if you're into Retro games, Roleplay games or gaming in general! So a few years ago (2012) I heard about this Kickstarter going through the motions, and it appealed to me right away; Retro style gameplay, card based game, two to four players, it looked and sounded awesome. So I followed it through its paces, but like most things Kickstarterish these days, I hate committing my meagre wages to unknown Kickstarters. This is mostly due to the lack of success with Kickstarts. Luckily it succeeded and it’s finally made it way across to the UK, albeit two years later. Inspired by the classic video games of old, with a twist of fantasy-based dungeon adventures from Dungeons and Dragons, Boss Monster sees you building a dungeon. This is where the twist lies; you’re not building it as a Hero, but as the Villain. That’s right, you want to bring adventurers into your dangerous dungeon and slaughter them. The more you kill, the closer you get to victory, but each Hero that succeeds brings danger. If too many Heroes manage to plunder your dungeon, you will die! 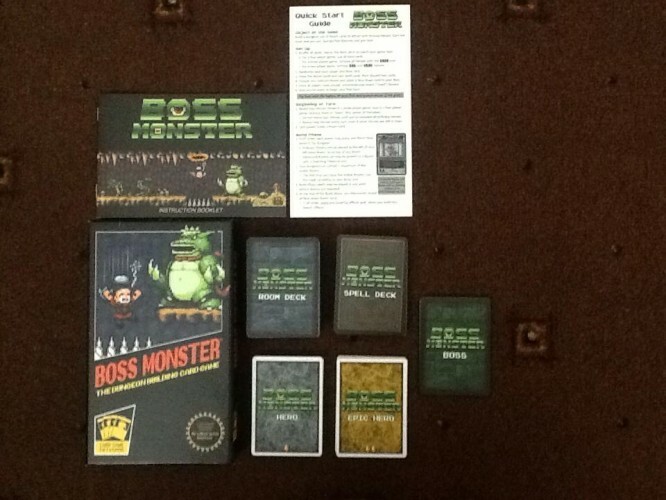 Boss Monster is a card game where two to four players build their dungeons around their “Boss” card, from which you have eight to choose from. Then using a seventy-five card “Room” deck, you go about building your dungeon. Each room card has a treasure value and once you hit the magic number of five rooms, your Boss levels up, activating its ability. All the while two ( or three, or four, dependant on number of players) heroes a turn appear in the local “Town” and then attempt to plunder your treasure from your dungeon. If you take five wounds, you lose. If you manage to acquire ten souls, victory is yours! With spells to throw around, and each room possessing its own abilities, the combinations are near endless. With the varying tactics available, I never got bored playing it, and it’s something that you can set up and start playing within minutes. I also picked up Tools of Hero-Kind, an add-on to the original, which adds two spells and four advanced rooms to the game. It also adds a new card type to the game; Items. These items automatically latch onto the heroes when they appear in town, making them tougher to deal with. If you do manage to defeat those heroes however, the items become yours to use on your enemies. This adds a fantastic new element to the game, and after using this I can definitely say that the game improved vastly from the vanilla game out of the box. This is a must add-on for anyone who buys, or already owns, Boss Monster. 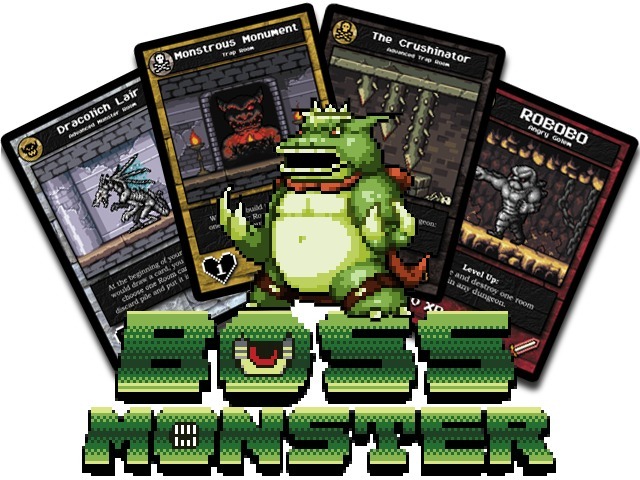 Overall I am outstandingly happy with my purchase of Boss Monster, and I would whole heartedly advise anyone who loves classic D&D, or playing NES RPGs/side scrollers, to go out and buy it now. It’ll be a walk down memory lane that you will be happy to repeat week after week. Also why not check out their brand new Kickstarter, where they are translating the game to electronic format. 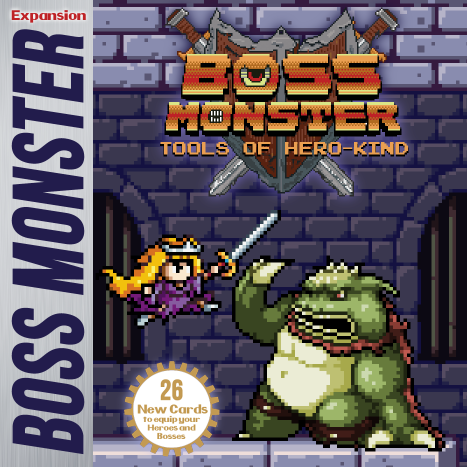 Boss Monster is available for between £13-20 depending on location and shop, Tools of Hero-Kind is around £10 as an add-on.